Take a load off! National Hammock Day is celebrated every year on July 22 to commemorate the universal symbol for relaxation. 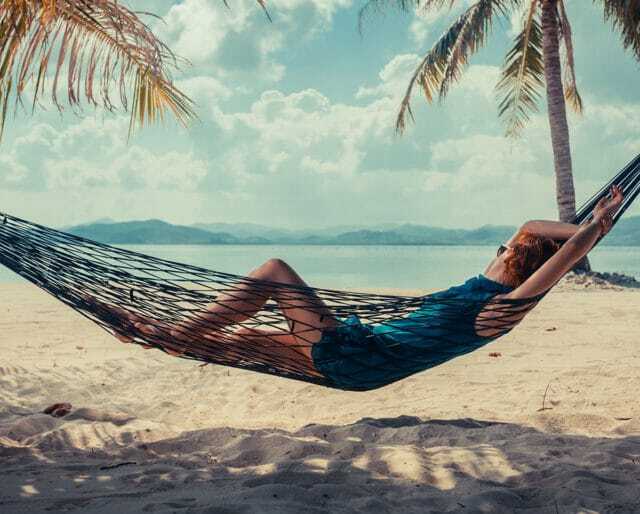 Developed by the Mayans of Central and South America for sleeping or resting, a hammock is a sling made of fabric, rope or netting, which is suspended between two points such as posts or trees. Most often, hammocks were made from the woven bark from the Hamack Tree — hence “hamacas”. Today the hammock is often seen as symbol of summer, leisure, relaxation and simple, easy living. So grab your favorite book, put your feet up and relax! Find two sturdy, conveniently located trees or posts and set up your hammock. The versatile slings are now popping up as interior decor. They’ve been spotted adorning the walls of some of our favorite shops, homes and hotels. So you can even celebrate Hammock Day indoors. Whether you’re indoors or out, putting up a hammock creates a perfect oasis. Don’t have a hammock? No worries. Improvise. Grab your favorite beach towel or picnic blanket and head to your nearest beach or park. You may not be relaxing in the air, but you’ll still be relaxing, and that’s the whole point of the day! Yep, hammocks at work are becoming all the rage. Some of the world’s best known companies decided to think outside the box, so they placed hammocks over plush carpet so that their employees can recharge for the second half of the day. Feeling rested is the cornerstone of productivity. Don’t forget to get your boss’ permission first. You go to work for eight hours, come home, and have to cook dinner. If you’re a parent, you have to take care of your child on top of all of that. Life can be so hectic, so self-care is very important. On National Hammock Day, you get to take a break from all that craziness and recharge. We could all use a few minutes away from our smart phones and computers. Participating in the national holiday allows you to unplug from technology, relax, get outside and get some fresh air. But if you must bring your phone, turn off your ringer and turn up your playlist. You have to admit, taking midday naps was the one of the best things about being a kid. National Hammock Day is a day where you can indulge in a guilt-free adult nap. A short nap of 20-30 minutes can help to improve mood, alertness and performance.